Host nation Papua New Guinea was humiliated by more experienced Brazil with 9 goals to none at the Sir John Guise Stadium in Port Moresby last night. Over 12 000 enthusiastic football lovers filled the stadium to watch the game which was also telecasted live on TV. PNG Prime Minister O’Neil kicked off the tournament and did the official opening honours while Port Moresby Governor Powes Parkop, Sports Minister Justin Tkatchenko, FIFA regional vice-president and OFC president David Chung and FIFA deputy chairwoman Sonia Bien Aime stood by him. 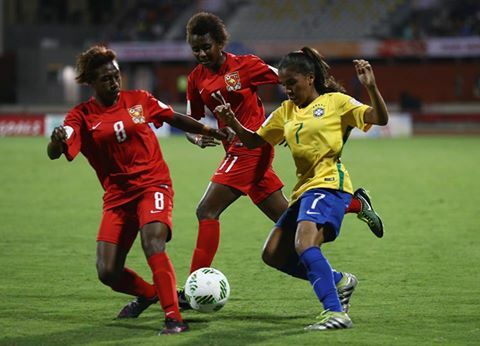 The opening matches played yesterday at the Sir John Guise Stadium saw North Korea beat Sweden 2 - 0 while Brazil thrashed PNG 9 - 0. In other matches played at Bava Park saw Spain beat Canada 5 - 0 while Japan outclassed Nigeria 6 - 0.